Road Atlanta is one of those iconic race tracks that has a unique sense of history about it. Like many tracks across the US, Road Atlanta has rich racing history, hosting a variety of racing venues on its grounds for decades. 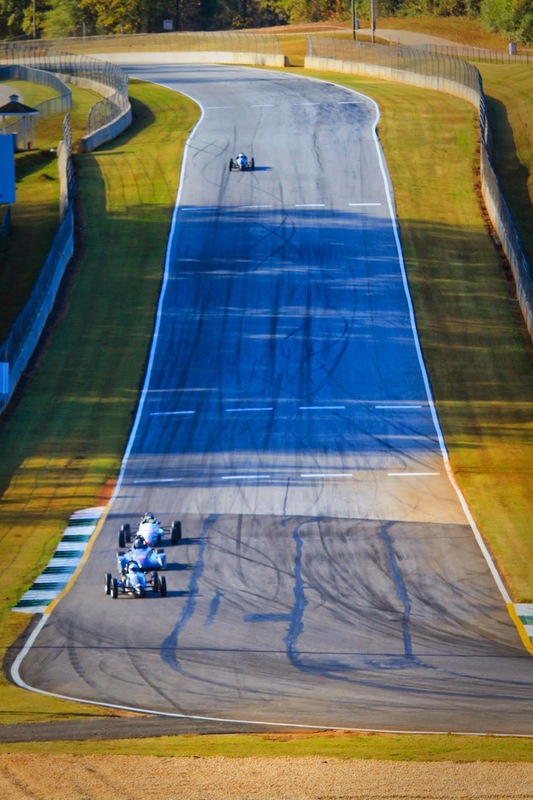 This track is particularly known for hosting Petit Le Mans, which also attracts drivers from across the globe. This wouldn’t be my first time visiting Road Atlanta, as I have worked Petit as a photographer years prior. I knew the track well from behind the walls, but this would be my first time driving it myself. At long last, I would finally get to see this infamous road course from the other side of the fence. For those familiar with Formula F, Honda Performance Development (HPD) developed a kit that consists of a Honda Fit 4-cylinder engine, paired with chassis-compatible engine mounting hardware. Last but not least, behind the engine sat a Hewland “dog-box” transmission. Minus the addition to some new chassis designs, much of the class hasn’t changed. However, the new Honda-powered Formula F will ensure that this class not only lives on, but continues to grow across North America. In terms of Performance, the Honda engine doesn’t disappoint. The overall power, consistent torque in higher RPM ranges, and responsiveness to throttle inputs make the F1600 a very strong contender. 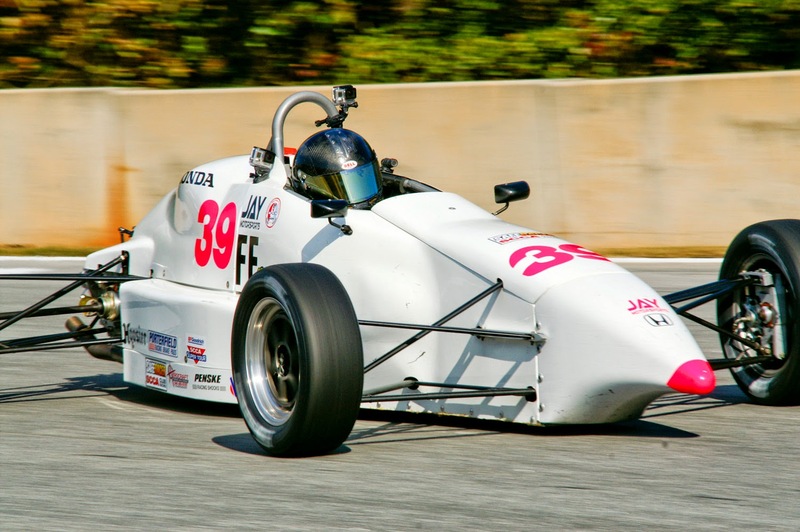 To make matters more interesting, the F1600 series is expected to expand through select regions of US and Canada, bringing more single-class racing opportunities beyond Formula F in SCCA. As a racer whose resume is filled with a history of sports cars, switching to the realm of formula car racing introduces a series of very specific adaptations. But anyone looking to get into formula car racing will find the Honda powered F1600 a delight to drive. Becoming familiar with this platform began with a full day of testing with Palmetto Florida based team Jay Motorsports, led by Jay Green. This F1600 wore some very nice shoes I might add, none other than Hoosier racing slicks. Unlike the DOT rubber, Hoosier the slick compound has superb grip, which can be very confidence inspiring. My general practice is to build confidence in stages, then experiment within appropriate places at the track. I felt this was particularly important, not only because the compound was unfamiliar, but so too was the platform personality and the dog-box transmission. A new track, new tire compound, new car… no problem! I was immediately impressed with the level of mechanical grip the F1600 offers, which came in handy as I carried increasingly more speed into faster sections of the track, including turn-1 and turn 12. In sports cars I often rely on the sensations of body-roll of the chassis, the scrubbing of the tires underneath me, and the variances of load transfer. 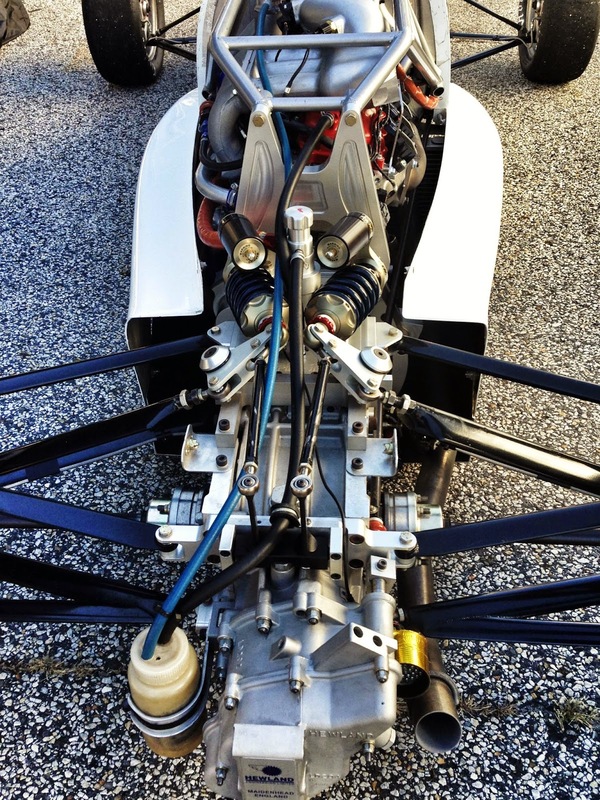 In the F1600 you have to be one with the car as a whole, cinched in so tight where it almost hurts. It goes without saying that a proper seating position is absolutely imperative, far more than any sports car. Driving a formula car in general is an incredibly tactile experience. For every groove, dip, bump, and variety of textures on the road are all forms of feedback that a driver needs to understand. Equally impressive is the braking in this car. The F1600 doesn’t have wings for downforce, but for what it lacks the car makes up for in its enjoyable simplicity. 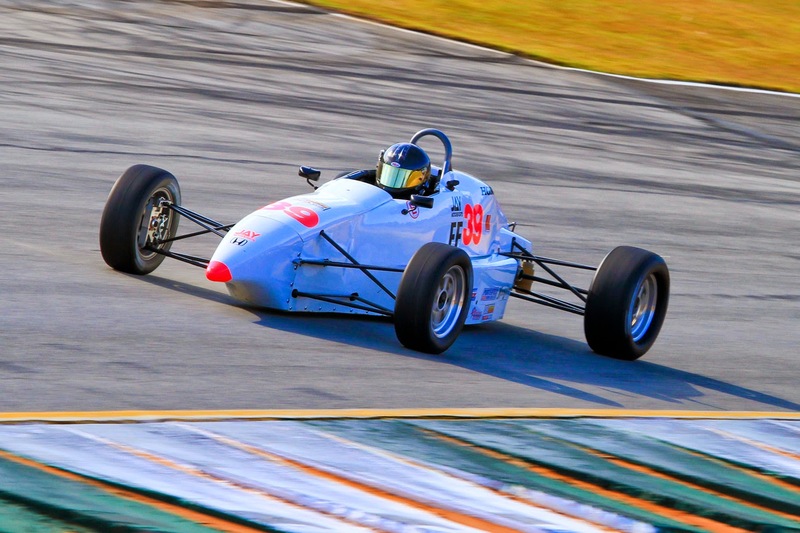 The F1600 is a great option for a driver looking to jump into a purpose-built race car. As with any no-frills racing machine, drivers are required to be deliberate, smooth and assertive When you apply the brakes correctly, the deceleration can be strong enough to relocate your guts to your feet. It takes some familiarity to brake crisply, quickly and late, which is also the mix of elements that satisfies the F1600. I understood braking in sports cars, however I had to set my learned tendencies aside to appease the needs of F1600, and of course, achieve those lower lap times. Jay Green did a fantastic job helping me sort through data and video, not to mention supporting the requirements of the car. It takes a certain kind of personality to work with drivers and enable them to properly absorb information whilst they learn something entirely new. This was an area that Jay clearly excelled, making each subsequent session productive. At the end of both testing and qualifying days, I made it my mission to review data and video back at my hotel. My goal was to be prepared first thing each morning and address areas for improvement. It’s simple for a driver to jump into a car and drive, but it’s a whole other matter to be tenacious in your pursuit of learning. You have to want success from your core. With some room to grow, we qualified P3 in class after our two designated qualifying sessions. Race day quickly approached and while the weather was bitterly cold outside, I was extremely eager to get back into the car and have my head in the wind. In my mind, I had carefully selected a series of items that I wanted to work on during the race, all while chasing the leaders in class. My tactics seemed to work for a time, however an extremely long stint under caution and patches of traffic spoiled some of my plan. I was destined to settle into my position all while weaving through lapped-traffic. There is no magic solution for lightning fast lap-times, though seat time is a very close second. By the end of the 40-minute race I had settled into a rhythm after the yellow flags were removed, closing the race in third. With the right mindset, I have always believed that properly resourcing expert knowledge can help build a better driver. When you have a good team around you, put their knowledge to work. With Jay Green at my side, I wasn’t going to let any of his input or expertise go to waste. Driving the F1600 at this event proved to be one of the most enjoyable and inspiring learning experiences. 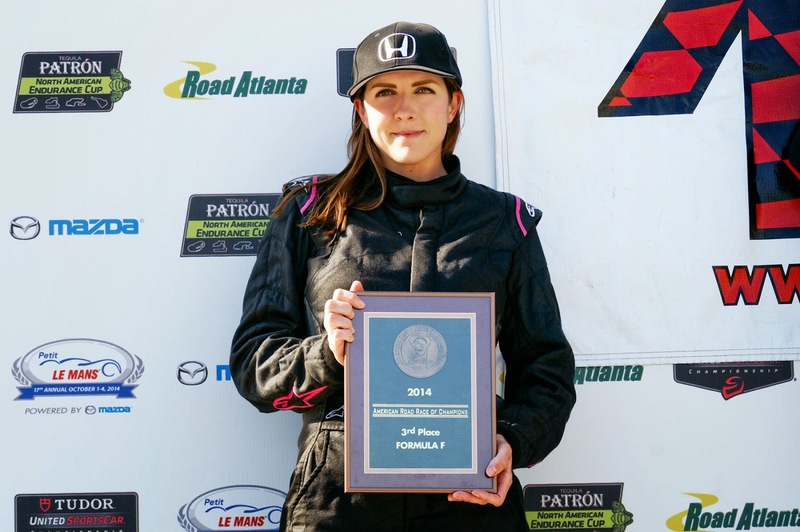 It’s safe to say that my success at Road Atlanta is attributed partly because of my supporters, but equally so was an appropriate mindset that carried me towards the podium. Special thanks to my family, Hoosier Racing Tire, Jay Motorsports, and G-Speed Race Management. I’m definitely looking forward to more seat time in a race car without doors!